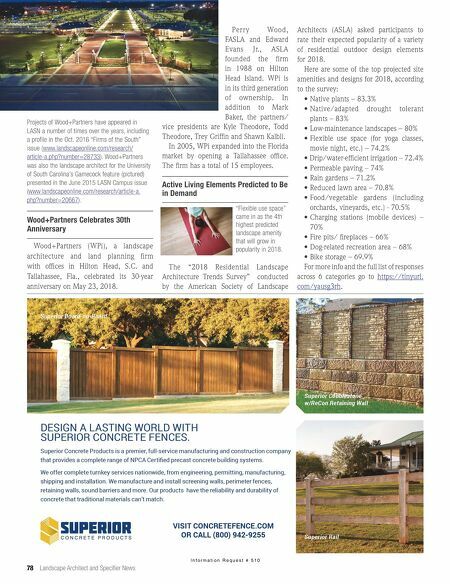 78 Landscape Architect and Specifier News I n f o r m a t i o n R e q u e s t # 5 1 0 Projects of Wood+Partners have appeared in LASN a number of times over the years, including a profile in the Oct. 2016 "Firms of the South" issue ( www.landscapeonline.com/research/ article-a.php?number=28733 ). 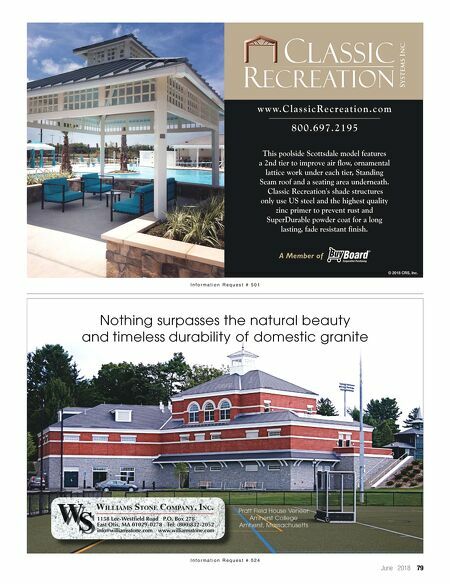 Wood+Partners was also the landscape architect for the University of South Carolina's Gamecock feature (pictured) presented in the June 2015 LASN Campus issue ( www.landscapeonline.com/research/article-a. php?number=20667 ). Wood+Partners Celebrates 30th Anniversary Wood+Partners (WPi), a landscape architecture and land planning firm with offices in Hilton Head, S.C. and Tallahassee, Fla., celebrated its 30-year anniversary on May 23, 2018. Perry Wood, FASLA and Edward Evans Jr., ASLA founded the firm in 1988 on Hilton Head Island. WPi is in its third generation of ownership. In addition to Mark Baker, the partners/ vice presidents are Kyle Theodore, Todd Theodore, Trey Griffin and Shawn Kalbli. In 2005, WPi expanded into the Florida market by opening a Tallahassee office. The firm has a total of 15 employees. Active Living Elements Predicted to Be in Demand "Flexible use space" came in as the 4th highest predicted landscape amenity that will grow in popularity in 2018. The "2018 Residential Landscape Architecture Trends Survey" conducted by the American Society of Landscape Architects (ASLA) asked participants to rate their expected popularity of a variety of residential outdoor design elements for 2018. Here are some of the top projected site amenities and designs for 2018, according to the survey: • Native plants – 83.3% • Native/adapted drought tolerant plants – 83% • Low-maintenance landscapes – 80% • Flexible use space (for yoga classes, movie night, etc.) – 74.2% • Drip/water-efficient irrigation – 72.4% • Permeable paving – 74% • Rain gardens – 71.2% • Reduced lawn area – 70.8% • Food/vegetable gardens (including orchards, vineyards, etc.) - 70.5% • Charging stations (mobile devices) – 70% • Fire pits/ fireplaces – 66% • Dog-related recreation area – 68% • Bike storage – 69.9% For more info and the full list of responses across 6 categories go to https://tinyurl. com/yausg3rh .